One item we consistently recommend to pool owners is a safety cover that will protect your pool while at the same time guard against children and pets. In fact, we at Family Pool Fun believe that this is item is a vital pool product. In fact, we keep more than 2,000 units in stock and guarantee same day shipping on orders received before 3pm CST. Our customers often comment on the ease of installing a safety pool cover. As an industry leader, Arctic Armor works hard to bring simple solutions with advanced protection to the pool owner. Their innovative approach to deliver incredibly strong mesh coverings is yet another obvious strength, and one of the reasons we at FamilyPoolFun.com stand by the brand. In fact, Arctic Armor takes an aggressive approach when it comes to their warranty. By offering 12, 15 and 25 year warranties, they stand behind their product longer than any of their competitors including Loop-Loc, Rayner and Meyco. In fact, Arctic Armor offers the best in class 25 year warranty option that is unmatched. Choice regarding the warranty you want is nice, but so is having choices when it comes to colors. Unlike others, Arctic Armor offers multiple color choices on all of their products meaning that you, the customer, gets to decide what works best for you. Whether you select a mesh, a mesh step or a solid safety cover, you can have confidence knowing that you're buying a brand that understands what customers want. You can also rest easy knowing that Arctic Armor and FamilyPoolFun offer the most comprehensive selection of designs and models in one place. 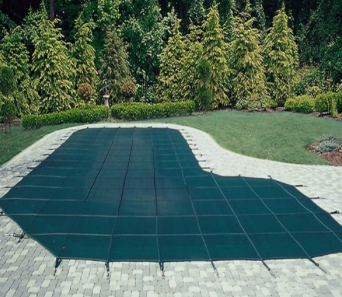 So if you are looking to seal up your pool with a solid cover that will drain the rain and snow away, or you're wanting a mesh cover that will keep out all the debris, rest comfortably in knowing that Family Pool Fun has just what you need. We back it up with our 75 day, money back guarantee. Summer is over. Winter is coming. Secure your pool with confidence.